What are the different file storage options and integrations available in Wealthbox? Wealthbox has different options for online file storage. We have a basic file storage feature (which uses Amazon EC2) called “Wealthbox Cloud“. For more robust online file storage options, we presently integrate with Box, Dropbox, and Google Drive. 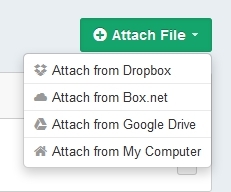 When you upload a file from your computer, the file will be stored in “Wealthbox Cloud.” If you attach a file from any of the integrated file storage services, Dropbox, Box.net or Google Drive, a link to the file will be found in the “Cloud Services” tab.